One thing that Craig Scarborough picked up on in one of his technical posts on Autosport was the FRIC (Front and Rear Inter-Connected) suspension system that Mercedes, and Lotus to some extent, have been utilising since 2011. The system is composed of a series of hydraulic lines that shift fluid between each corner of the suspension, even front to rear. 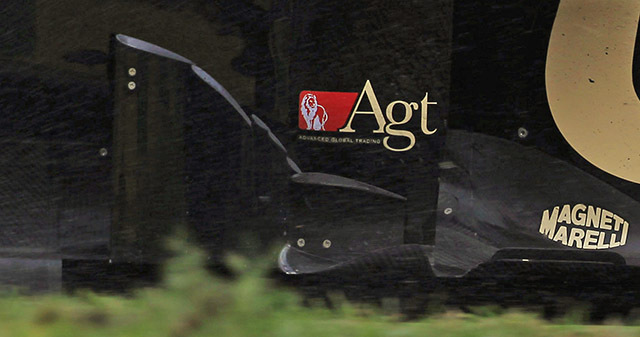 This system is particularly effective during the braking phase and very fast corners. As the car pitches (dives) under loading, the whole of the car is effectively tipped upwards at an angle. In the wind tunnel teams can run the cars with a slight pitch at best as the facility cannot accommodate a car with a lot of angle (yet). This angle on the car influences the aerodynamic stability and shifts the CoP (Centre of Pressure) further forward, causing a movement in balance. Where the FRIC system is so effective is that it reduces this diving as the car slows down by shifting the hydraulic fluid from the rear (where there is a lot less load on the suspension) to the front dampers of the car. This raises the front of the car to some degree, matching the rear and therefore reduces the shift of the CoP, thus increasing stability. The aerodynamics are also more efficient during this phase, therefore the car can actually stop a little bit quicker as their effectiveness increases as a constant ride height (that the teams mainly run in the wind tunnel) is maintained throughout. The fluid then shifts back as the force reduces at the front of the car, balancing itself accordingly at each upright for the corner that the driver is about to take. The same effect also applies for loading on either side of the car in the high-speed corners. Mercedes have notably been able to run their car very soft to cope with the bumps and kerbs whilst still having good stability at high-speed. In Malaysia, we got to see how the system is tuned after the nose of the W04 was removed and two hydraulic lines were linked onto the suspension area. 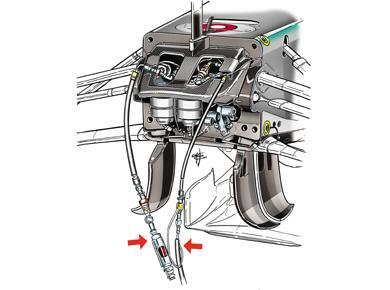 Above is an image by Giorgio Piola showing how Mercedes apply the fluid to the system. The valves and wiring provide the right amount of pressure needed in the system for a given track, as each circuit will require a unique setup and appropriate tuning. The engineers will calculate and fine tune this pressure and quantity during the practise sessions and also on the simulators back at the factory. Mercedes also brought new under-chassis turning vanes (featured in image above) to manage airflow downstream of the underside of the nose and bulkhead section. 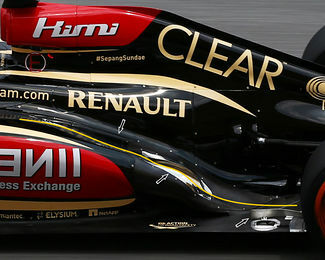 Out of all the teams, Lotus brought the most updates, featuring a new front wing, barge boards and exhausts, although only Kimi Raikkonen ran the new exhaust system. Above are the slightly modified barge boards. In Melbourne, they featured a 3-tier profile, each tier generating its own vortice which, when all combined together, created a larger vortice to energise the airflow around the undercut of the sidepod. For Malaysia they made some small changes: The third and final (trailing) stage has been split again along the top, creating three further elements to the system to create an even stronger energy of flow. 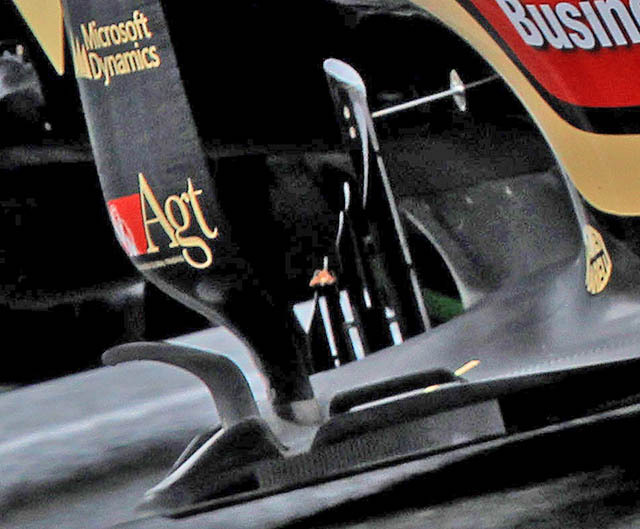 Also evident in this image is an additional turning vane that sits beside the sidepod airflow conditioner on the floor of the E21. Note also the perforated floor edges aft of the conditioner that also help tidy up flow coming off of the bargeboard and around the side of the floor. This is another image of the leading edge of the floor along the side of the car. The edges of the floor peel upwards to not only guide flow along the top of the floor, but also create consistent airflow beneath it, letting out turbulent air that comes off of the bargeboard and front splitter assembly. A view from behind the bargeboard section. Here we can see the amount of elements there are in the assembly and how the whole system in front of the sidepod combines to direct flow around the sidepod. These are the new exhausts that Kimi was running throughout the race weekend. The carbon inner trough has been replaced by a highly heat resistant alloy that now features bulges, much akin to the Red Bull solution, guiding the exhaust plume downwards along the floor. 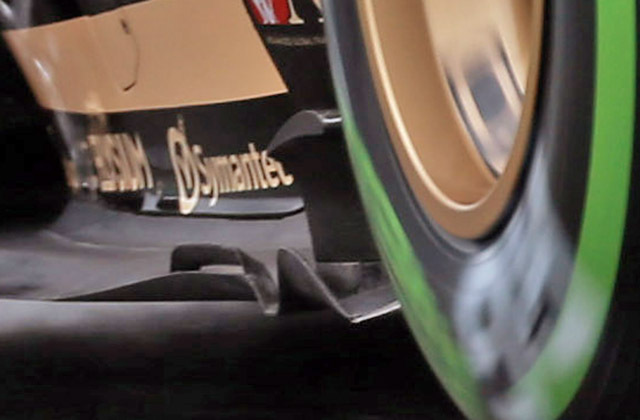 The yellow line shows the path that the downwashed airflow takes as it follows the gradient of the sidepod, eventually ending up plugging the gap between the tyre and the floor and, effectively, expanding the diffuser area. This entry was posted in 2013 Highlights, Technical Highlights on March 25, 2013 by thewptformula. Hmm, never heard of FRIC before. Would they be of more use at a circuit with fast corners, or at more stop-start circuits? I’d guess the latter, but, as we’ve established, technical stuff isn’t my forte. A lack of McLaren upgrades but better pace suggests that they’ve simply improved their setup. As mentioned, they have only just fully got to grips with it over the last year or so. Hence why they have previously struggled with tyre management. Mercedes had an employee who set up a similar system for his motorbike to race the TT with, reducing pitch and increasing stability. He then took this idea to the car and it has so far been successful. Whereas Red Bull have overall superior downforce, the Mercedes FRIC system allows them to exploit their aerodynamics to the maximum in corners and under braking, so they are still behind in terms of overall downforce on the car. The system is much better when utilised at circuits with fast corners and heavy braking zones, so China should be a good circuit for them. Coupled with a strong engine, more updates and two on form drivers, expect them to do well in a few weeks’ time. As for McLaren, they ran a lot of experimental parts on the front suspension assembly to attempt to reduce the front ride height and get the performance of the aero in a much wider window/range of ride height. The smooth track surface helped, but one notable aspect of the MP4-28 is that it had very good tyre management under both Button and Perez, despite the high degredation. If they can find more aero performance by sorting out their setup issues, then expect them to come back to the front of the grid, but it may be too late for them by that point.